How to Hack Linux Computer Just with Backspace Key ? Are you using a Linux Operating system on your machine, if yes then this is must read tutorial. 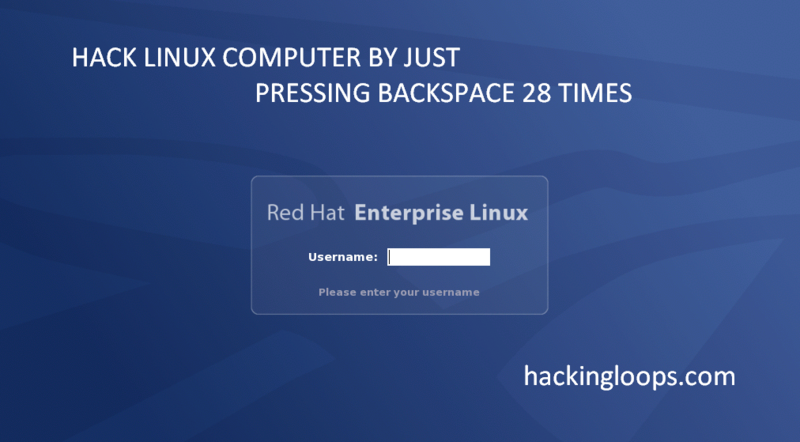 Security researchers from University of Valencia has recently discovered a bug in most of Linux distributions that anyone can bypass any Linux authentication during boot up process by just pressing backspace key 28 times. Yes you read it right, just by pressing backspace key 28 times on startup login window will allow you to bypass authentication process i.e. Hack Linux operating system. Let read more about it. What’s the actual bug which allows Hacking of Linux Boot Authentication process? Actually the bug is not in Kernel nor in Operating system itself, bug lies in Grub2. Yes you read it right its in Grand Unified Bootloader, which is used by most Linux systems to boot the operating system when the PC starts. Grub 2 has integer underflow vulnerability, which affects the grub_password_get() function. This allows hackers to bypass the usual authentication process of Linux Computers which used Grub2 as boot loader. Now let’s learn how hackers can exploit this vulnerability to get complete access of you Linux Machine. How to Hack Linux using this vulnerability? How Hacker’s can exploit Grub2 Vulnerability to get access of your Linux Computer? If you are using Linux Operating System and your Linux Distribution is using GRUB version from 1.98 to 2.02 then your machine is vulnerable to this backspace bug. In order to test this, Just hit the backspace key 28 times at the Grub username prompt during power-up. This will open a “Grub rescue shell“. This rescue shell allows unauthenticated access to a computer and the ability to load another environment. From this shell, an attacker could gain access to all the data on your computer, and can misuse it to steal or delete all the data, or install persistent malware or rootkit on your Linux Machine. How to protect your Linux Computer from this Vulnerability? Grub2 Backspace Vulnerability affects all distributions which are published since December 2009 to present date, but older Linux distribution versions are not affected by this bug. Others (released by researchers) for all distributions. We all know Linux is still considered as most secured operating system but its also prone to bugs, so always keep yourself updated and never believe in myth’s that Linux cannot be hacked. I hope you all have enjoyed our tutorial on “How to Hack Linux System using Backspace Key”. Keep Learning !! Keep Connected ! !